A key difference between Speech Craft and other introductory public speaking texts is one of emphasis: speechmaking is presented, first and foremost, as the indispensable art of community-building. Learning the skills of writing and delivering a speech will help students in their education, in their careers, in participating in public life, and most certainly in advocating for social change. But more fundamental to all of these ends is the means of building relationships with groups. Throughout Speech Craft, students are presented with powerful examples and explanations of concepts that highlight activism, social change, and community building. The result is a text that shows students public speaking is an art that aspires toward being with others, toward sharing, and however paradoxically, toward listening better; it shows that the craft of speaking is not about you, it's about us. Please scroll through these from-the text examples and evidence that highlight Speech Craft's unique emphasis on community and social change. After looking through, take this two question survey to tell us what you think. Chapter 2 combines listening and ethics, topics typically covered separately, into a single chapter. By bringing these topics together and providing modern examples, students can more easily see the connections between listening and speaking. They learn that to be an ethical speaker one must first connect with a community and be an ethical listener. In Chapter 3: Audience Analysis, Speech Craft breaks from the classic historical speeches and instead features Harvey Milk, the first openly gay elected official in the United States. The sidebar feature explores how Milk delivers his speech "Hope" to an audience that consisted mostly of lesbian, gay, bisexual, and trans people. Chapter 7 opens with a photo from one of the protests against the Dakota Access Pipeline. The chapter focuses on organizing a speech and compares this process to organizing a protest—an excellent example of how the author is able to bring community and social change into even the most pragmatic, skills-based portion of the course. While most books cover special occasion speeches, like toasts and eulogies, rarely is this speech connected back to the idea of community. 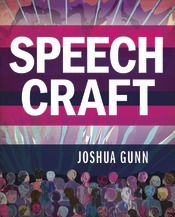 In Chapter 13: Celebratory Speaking, Josh Gunn emphasizes how celebratory speaking brings together the community in a celebration of the present. Regarding eulogies, he notes that "When you speak to honor a loved one, friend, or colleague, you are speaking to praise the life he or she lived, his or her redeeming qualities or deeds, and to bring the audience together as a community in their memory of the deceased in the present."